INDICATIONS Science Plan* Feline Adult is formulated to meet the nutritional requirements of the adult cat from maturity (at 12 months of age) until 7 years old. 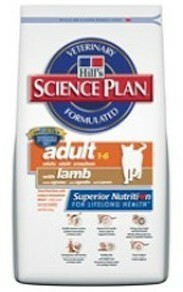 Science Plan* Feline Adult supports urinary tract health by controlling mineral levels and urinary health. Science Plan Feline Adult also contains a Superior Antioxidant Formula to reduce oxidative cell damage. FEEDING GUIDE many factors such as environmental conditions, activity level, stage of life and induividual variation (temperment, stress) can affect the amount of food needed. Adult cats should be fed only sufficient food to maintain their ideal body weight, in one or two meals per day. Science Plan* Adult should not be supplemented as such additional may upset the nutritional balance. Fresh water should be available at all times.